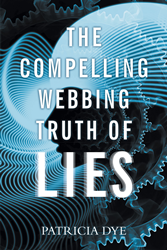 Recent release “The Compelling Webbing: Truth of Lies” from Page Publishing author Patricia Dye casts a wide net across multiple genres—sci-fi, romance, and realism—and attempts to offer readers suspense with each turn of the page. Patricia Dye, a longtime dreamer who found the necessary discipline to undergo this project, has completed her new book “The Compelling Webbing: Truth of Lies”: an ambitious compilation of prose varying from short stories to novellas, all of which attempt to encapsulate the human condition in never-before seen ways. Published by New York City-based Page Publishing, each of Patricia Dye’s stories brings readers into vividly described locales that range from the natural world of contemporary Earth, to unvisited lands and times created by the author. “I’ve always imagined writing to be where I could allow my creativity to run free, creating worlds with many dimensions, hoping to touch the hearts and souls of the reader,” Patricia Dye continued. Readers who wish to travel space and time without leaving the comfort of their chairs can purchase “The Compelling Webbing: Truth of Lies” at bookstores everywhere, or online at the Apple iTunes store, Amazon, Google Play or Barnes and Noble.